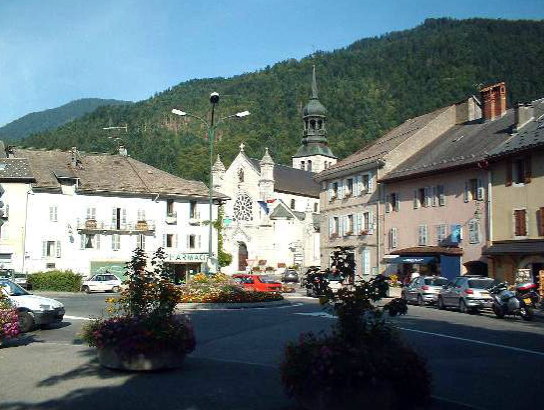 At the mo T4rdis2 is sat in a small Aire near the town of Faverges which is about 5 miles from Lake Annecy. We came yesterday for a ride around part of the lake, and we stayed because the weather man predicted lots of rain for today so we thought we may as well get our huge heap of laundry done at the nearby launderette. Then once our chores were done our plan was to have a lazy afternoon in this free spot while we waited for the bad weather to pass by - but it didn't quite work out that way. The rain started in the early hours of the morning, and by getting up time it was coming down in buckets - and it was soon after that that we realised we'd got a bit of a problem in the form of a leak! There was a puddle that was slowly increasing in size leaking from under our mid ship belted seats - 😱oh no😱! As our water storage tank is located under there my first thought was that it was leaking from there but a quick inspection excluded that. So then John scrabbled about and shone lights in dark places behind the cupboards and the culprit turned out to be a leaky seal around the kitchen window that was allowing rain water to seep in! Unfortunately, the kitchen window has a surround that can't be dismantled without removing other things first so the fix required a good bit of stripping down to get at the screws holding the window casing in place - and when John started to tighten them he soon found that a good few of them were very loose indeed. So now it's fingers crossed that this will have pulled the seals back together and cured the problem but we're probably not going to find out until it rains again. Our other issue for today was the washing - we waltzed on to the launderette with 2 big bags which we tipped into a 14 kg machine which did it's job very well! But when it came to drying our huge load we quickly discovered the tumble dryer was KAPUT, so as the rain continued for most of the day the inside of T4rdis2 soon resembled a Chinese Laundry with socks, smalls and everything else hanging from every hook and cranny I could find! Well the good news is John's 'fix' 🔨 seems to have done the trick! The rain sploshed down with gay abandon for a good part of the night but when we got up this morning there were no puddles on the floor and no sign of any water seepage around or under the kitchen window - therefore a big sigh of relief was breathed by both of us! But the day, or at least the morning seemed set to be wet - so what were we going to do? Well, we'd more or less decided to stay put for another day because we've got good services and internet, and the Aire is free - so we thought we might as well stay here to wait out the bad weather. 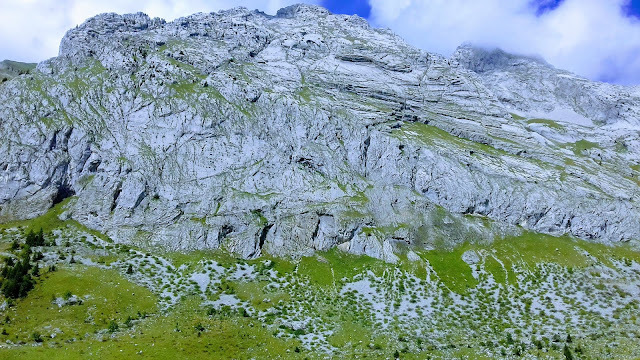 Therefore, to facilitate a little outing in the afternoon John had a quick scan around on his maps and found 'The Grotte and Cascade Seythenex' which was only a little over a mile away. 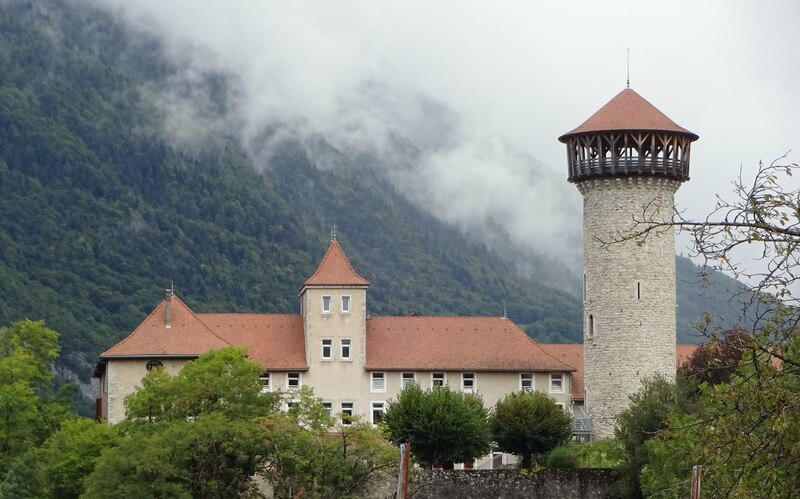 So after an early lunch (by which time the rain had stopped) we donned our walking shoes and coats and set off through the pretty town of Faverges and up the hill to what used to be a water powered saw mill, but which is now a tourist attraction. On the way we passed Le Chateau de Faverges which houses the Museum 'Des Papillons et Insectes' a collection of nearly 4,500 butterflies, insects and arachnids from all over the world - but I'm not that keen on creepy crawlies so we didn't go in! And from there we pushed on for about another mile to the Grotto. Here we had a choice - we could either just see the cascades or we could go underground and see the caves, but as the tour had to be guided and was in French we decided to just do the former. 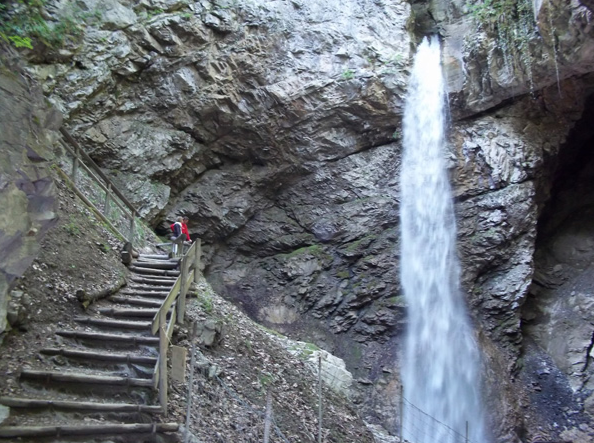 The waterfalls (of which there are two) are accessed via footbridges and wooden stairs that take you first to the foot of the lower 40 metre fall, and then, as long as your prepared to climb the 120 steep steps, you find yourself on a bridge at the bottom of the second fall and above the first one! And it was well worth the effort because all the rain had ensured the falls were running with a good deal of power behind them! Now, there was also an easy way down - rather than having to renegotiate the wet slippery stairways we could have just zipped our way back! But we hadn't got our adventurous hats on today so we went back the we had come 😂. This morning brought more rain, but after 3 days in the same place we decided to leave Faverges, so first we headed through Annecy to collect some gas (LPG), and then further into the hills to the town of Thónes where John had identified a couple of Aires. However, what we hadn't realised was that there was a food fare in the town so the first one was full - mostly with parked cars! Luckily the second one was about a mile away from the busy centre, right by a lake and empty - so without further ado we adopted it as our home for the next couple of days! Happily, after lunch the rain gave-way to a short spell of sunshine so we took the opportunity to nip back into the town to see what it had to offer - we explored the thronged streets and even poked our noses into the Food Marquees - and it was here that we got to sample reblochon 🧀. Reblochon derives from the word 'reblocher' - which literally means 'to pinch the 🐄's udder again'! The tale goes that during the 14th century the landowners would tax the mountain farmers according to the amount of milk their herds produced, so therefore the farmers would stop short of fully milking the cows until after the landowner had measured the yield. The remaining milk was richer and was traditionally used to make cheese for their own use - thus Reblochon was invented - and as it was on offer today we brought some to try! Well, I thought Sunday was supposed to be a day of rest - but it certainly wasn't that for us today! 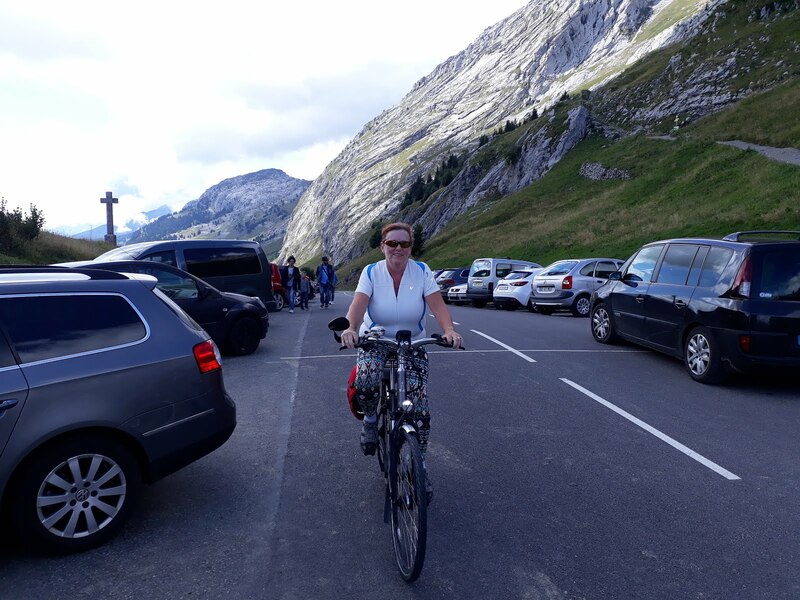 The day had dawned bright and sunny, so after all the rain that had kept us captive over the last few days we were determined to put our plan of riding up the Col de la Colombiere into action - but even with the help of our E-🚲🚲 it was bloody hard work! 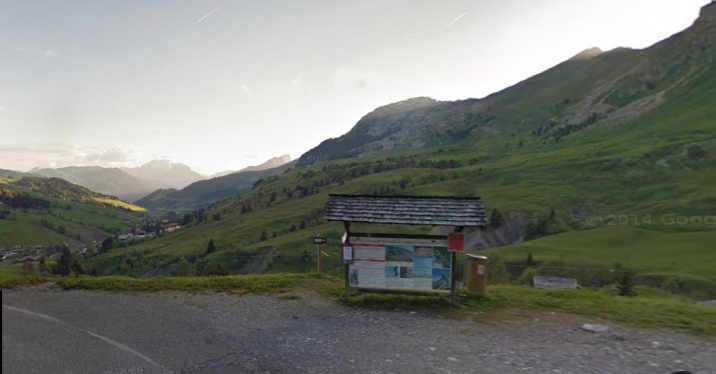 We left the van at about 11am and headed back into the town of Thonés before turning off on to the D909 to start a steady climb towards St Jean de Sixt. 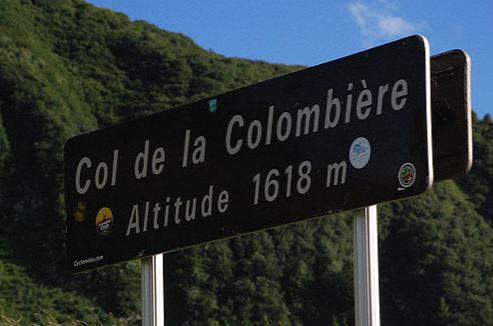 And it wasn't until we reached there at about 7 miles into our ride that we turned off onto the D4 to begin our ascent of the Col de Colombiere - a climb that we knew would be over 8 and half miles till we reached the top! 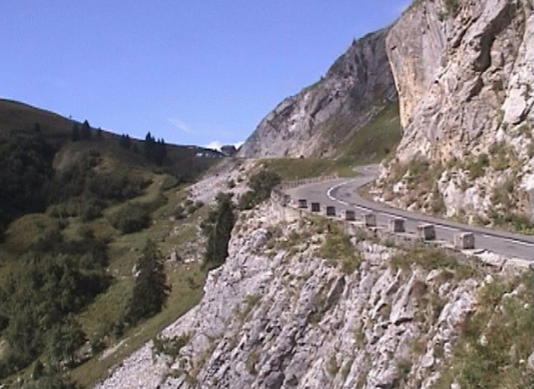 However, initially it didn't seem too bad because we were well and truly distracted from our task by the sheer beauty of the mountainous road along which we were traversing. 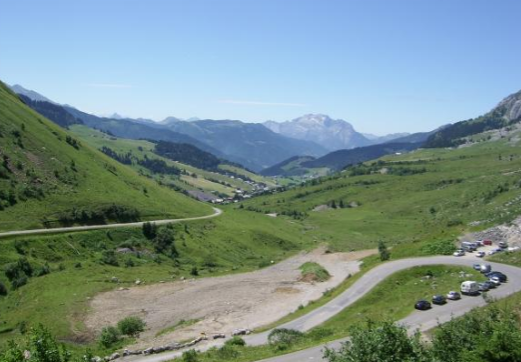 As we went we passed through the very picturesque ski villages of Le Grand Bornand and Chinaillon, and additionally, the hillsides were scattered with very grand Swiss style chalets many of which had geraniums flooding from their balconies. 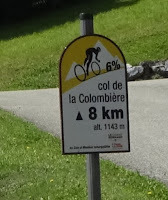 We also knew at each kilometre how much further and how steep our ride was to be because there were little yellow count down signs along the way. 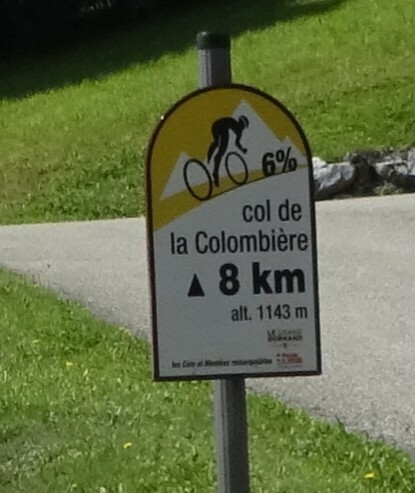 And I suppose this helped until we were passing the 3, 2 and 1km to go signs - these informed us that the steepness would increase by 1% each time - and as I was already well and truly knackered by then, this was maybe information that I didn't want! Anyway, we made it to the top - but for me - only just! When I'd caught my breath enough to get off my bike I'd got proper jelly legs that wobbled and felt as if they might give way! As you can see from the pic it was quite busy at the top so we only really paused to take a few photos before we nipped about a mile back down the hill to a picnic spot we's spied on the way up. Or more our style - a deserted picnic spot a bit further down overlooking the mountains and the valley. Now as you'd imagine, we descended much quicker than we'd gone up, but even though the sun continued to shine it was c c c cold as we descended! Especially when our speedos were creeping up to a maximum of over 31 mph - we could almost have done with a bit of newspaper like they shove down their shirts on The Tour de France! However, the participants in that race seem more like machines than men - how they manage to ride up and down hills like this one day after day is nothing short of amazing!